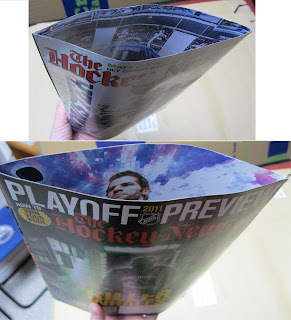 Here is a tutorial for making a custom gift bag out of magazine covers and pages. For tutorials on turning envelopes or newspaper pages into gift bags, visit: http://howaboutorange.blogspot.com/. 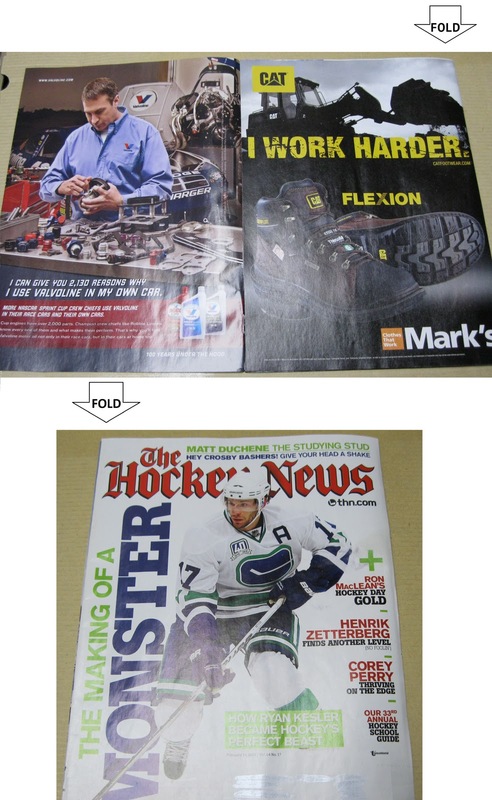 Here I have some spare pages, two full-sized pages (goalie and skater), and two full covers (remove the staples and spread open flat). 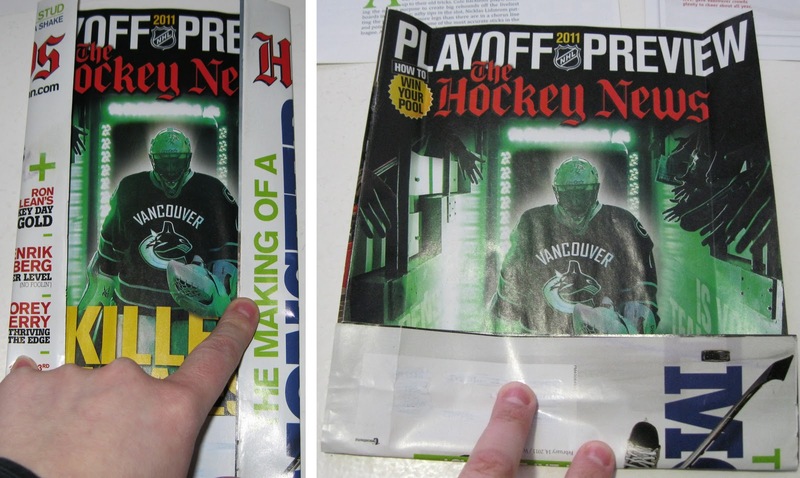 *I used pages from my favorite magazine, The Hockey News, which always has great covers, photos, and articles. DISCLAIMER: This is for a friend who is a Canucks fan - it would NOT be my first choice of teams if the bag was for myself. 1. 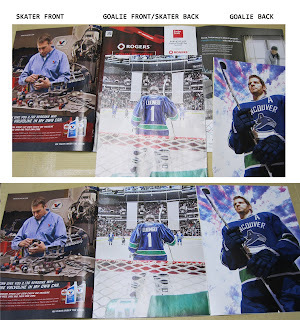 Layer your two covers so that they are both face-up with one front cover (goalie) on top of the back cover of the other (skater). Glue together. I used spray glue. 2. 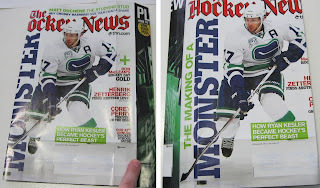 Flip everything over so you are looking at the insides of the covers but the text/photos are right-side up. Position your full-sized pages so that one is on the inside of the center page (goalie front cover) and the other is on the inside of the right page (goalie back cover). 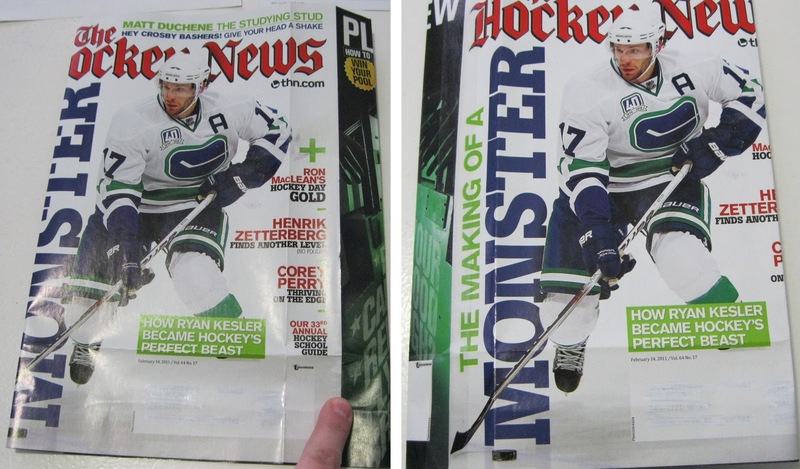 DOUBLE CHECK that you haven't got both of them on the back of your front covers. Glue. 3. Fold the right sight into the center THEN fold the left side in on top. DOUBLE CHECK that your full-page photos are face-to-face on the inside and that both your front covers are on the outside. 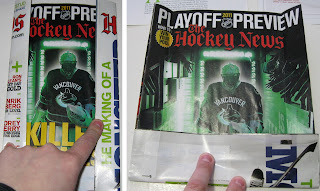 Glue the back of your full-page photo to the back of the front cover that you haven't glued to yet. 4. 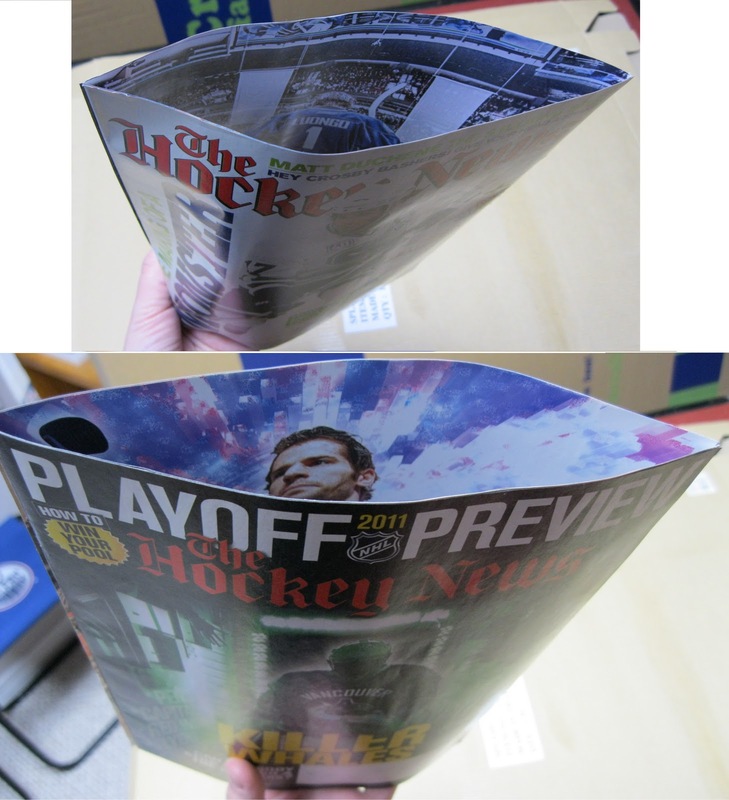 You should now have a flat tube with your full-page photos on the inside and your front covers on the outside. 5. Lay your "tube" on a flat surface. Fold the sides in at approx. 1" (2.5cm) and crease well. Open it back up. Fold the bottom up at approx. 2" (5cm) and crease well. Open it back up. 6. Fold and crease all these folds to the back also. When you do the side folds, puff the tube out and shift the edge from the joint between your covers to one of your new folds, then flatten it again so that you can tape down your joint to reinforce it. I used clear hockey tape. 7. Puff up your tube again and pinch your side folds so that it looks like a rectangle from the end. Slowly push in the side "flaps" of the bottom using your folds to keep the corners sharp. 8. Once you have your folds where you want them, crease them firmly and fold the newly formed (almost triangular) front and back flaps on top of your side flaps. Crease. Secure your layers with glue and/or tape. 9. If you want your bag to be able to lie flat, push in the sides (where you taped the seams) and fold the bottom to one side and crease. 10. Now your bag is basically complete. 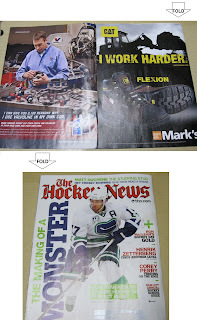 If you want, you can glue one of your spare pictures inside the bottom of the bag to hide your flaps. 11. You can either fold the top of your bag over and tape or staple it to close it (with the gift inside, obviously), or you can add handles. To add handles, pinch the top of the bag shut and punch two holes through both the front and back of the bag. Tie coordinating ribbon, cord or string through the holes, either in a circle or U-shape with big knots at the ends. You could also skip the holes and just glue and/or tape a loop of ribbon or string to the inside of both sides of the bag. *If you want to make a gift tag for your bag with your spare pictures and cardstock, make sure you add it to your handle BEFORE you knot or glue. If you forget, just add another piece of ribbon or string to your gift tag and tie it onto your handle. 12. DONE! You can use some of your spare pictures and pages to make a matching greeting card, decorated envelope, or even in lieu of tissue paper to hide the gift inside.